I’ve dabbled with Periscope and Meerkat with my own personal live streams (such as offering a sneak peek at the progress of my next comic book). Last night was my first time using mobile broadcasting for an event. 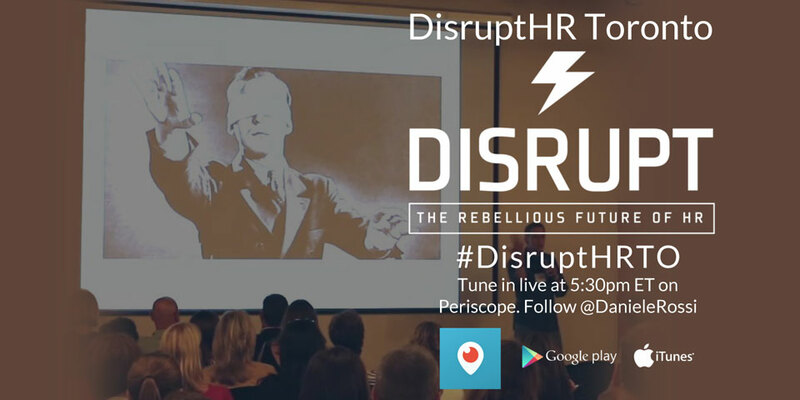 I had the pleasure of live streaming the very interesting #DisruptHRTO, an event for recruitment and HR professionals sharing new ideas since digital technology has disrupted their industry, too. There were 12 presenters who had 15 seconds for each of the 20 slides they put together on their topic about talent. 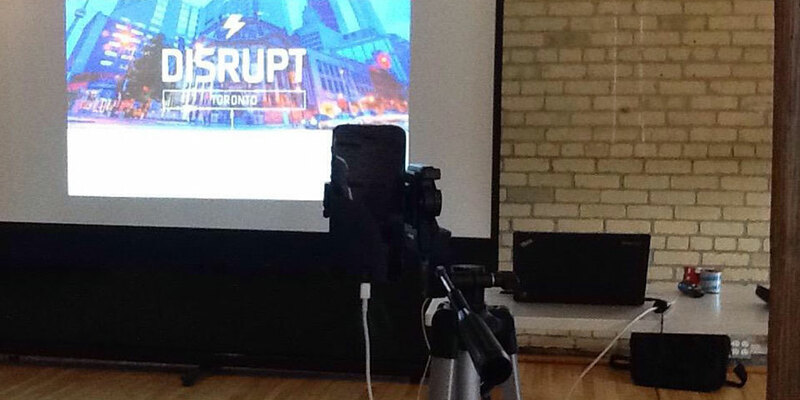 Tickets for the event sold out pretty quickly so I raised the idea to my friend and co-organizer, Jeff Waldman, of live streaming #DisruptHRTO for those who weren’t able to attend. We decided to use Periscope over Meerkat because, well, we just liked it better! Got the word out. Those who couldn’t get tickets needed to know! So we tweeted that the event would be live streamed and included instructions to download the Periscope app and follow me on Twitter. This way, users would have as low a barrier to viewing the event as possible. Periscope (and Meerkat) is a very new app so not many people may have heard about it. Created a promo ad. I created one that was optimized for sharing across social networks so no wording would get cut off in news feeds. Used a tripod. To save my arms during the 2.5 hour event and avoid camera shake, I brought along a tripod and my trusty Joby Grip Tight Mount to hook up my iPhone. Brought my charger cord. This way, I didn’t run out of battery power during the event. Ensured I was seated near a power cord. I brought along an extension cord just in case but luckily there was an electrical outlet right beside where I was sitting. Sat at the front. Since I was relying on my iPhone’s mic I needed to ensure the Periscope audience could hear the presenters. And since I was relying on my iPhone, I also needed to ensure the Periscope audience could see the presenters and their slides. I wanted to ensure that their faces and slides were able to fill up as much screen space as possible. No one wants to see tiny, far away faces. Avoided sitting in front of a sunny window. Well, I couldn’t avoid this since I couldn’t change the layout of the room and architecture of the building, however thankfully, people weren’t too dark in the stream. Avoided distracting attendees with my screen. Since I was sitting right at the front, I was conscious of the fact that attendees sitting around and behind me may find my screen distracting. So I dimmed it a bit and lowered my tripod so that my body could block everyone’s view as much as possible. I also turned off my notifications and turned on airplane mode. Thanked viewers for watching. I did this both on Periscope and Twitter with the #DisruptHRTO hash tag. I was all set. Only one little problem was since Periscope only allows you to broadcast vertically, I couldn’t fit both the speakers and their slideshows into the screen so I had to pan my iPhone once in a while. Mostly during introductions since speakers only had 15 seconds for each slide! We thought showing a bit of a behind-the-scenes pre-party before the presentations began. I walked around the room asking if anyone would like to introduce themselves on camera and talk about the work they did. This was challenging since most people didn’t want to be on camera and I didn’t want to interrupt anyone who was eating (the catered food by Zoë’s was really delicious by the way!) or who were engaged in a lively conversation. According to Periscope, we’ve had 22 viewers with a handful watching and chatting the entire broadcast. All viewers worked in the industry. So I think we did pretty good in our strategy of allowing those who couldn’t attend to still learn from the presentations which was the whole point of #DisruptHRTO. Considering how new Periscope is, the ultra-long broadcast time (during the commute and dinner hour), and niche subject area of recruitment and HR professionals, I think we did pretty well. I was checking out my Twitter feed after the broadcast and a great tip I received from one of my followers was to share my screen from my iPhone to my laptop so I could interact with Periscope viewers by text. I was verbally replying to them during the pre-show but obviously couldn’t do so during the presentations! I’ll definitely add this as part of my set up for future events. Not sure how I didn’t think of it before! Thanks @drgnmeme! @danielerossi nice setup, are you doing a screenshare to your pc so you can chat at the same time? In conclusion, mobile broadcasting is fun! And a great tool for events to allow those who cannot make it to participate and learn from presenters. I plan on using Periscope more in the future for both content marketing and engagement strategies. How have you been using mobile live streaming? Do you have a preference between Periscope and Meerkat (or another app entirely? )?